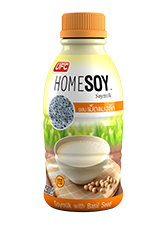 Homesoy with Basil Seed was an innovation introduced to the ready-to-drink soy market by UFC. The new product combines Homesoy authentic soy milk flavours with health benefits of the basil seeds making it a uniquely mouth-watering, convenient and healthy beverage. Homesoy with Basil Seed is an appropriate and convenient beverage for health conscious, vegetarian or vegan consumers. HomeSoy with Basil Seed does not contain any preservatives, animal fats and dairy product.